Aaron, going a bit off topic, but my S20A12-EX just arrived. Nothing on it say that it's the "extreme" model. How can I tell that its not one of the older models? All of the solar models are the extreme model and have been so for many months. Thank you Aaron for your quick reply! As I mentioned before I am very excited about the Charge Controller and I am looking forward to it keeping my brand new T-105's healthy for many years to come. Please let me know if I should post this somewhere else, or create a new thread... This is about off grid, best use, and equalization of batteries. I'm going to post photos of my simple set up. 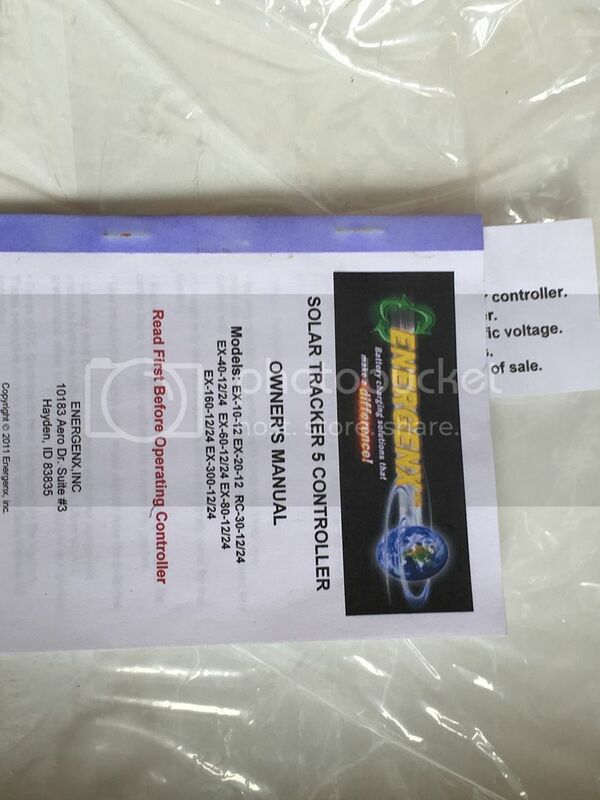 It works, and I'm hoping to upgrade my system to utilize my Tesla Charger Solar Tracker 5 12v 40amp charge controller when I upgrade my solar panels. 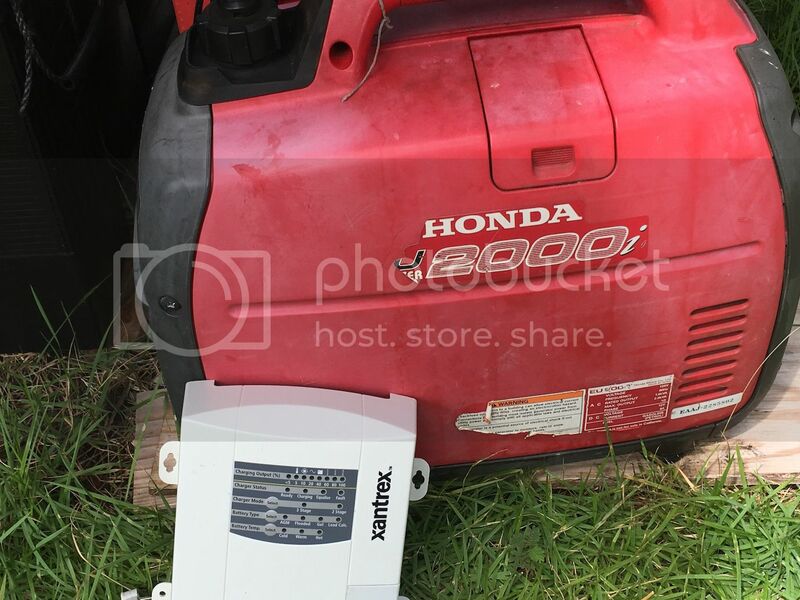 Currently, I'm wondering if I should incorporate this Xantrex 12v 40amp battery charger via my EU2000 Honda generator to help get to an equalization event. The best I've seen on sunny days is a bit over 14 volts showing on my MidNite charge controller. I have not seen it get to 15 volts, thus no equalization at 15.2v. I have absorb, float and equalize set to 14.8, 15, and 15.2 respectively. I'm looking forward to your replies and advice of best practices. I'm frustrated with current inability to get my 4 L-16s into equalization, even with the correct wiring configuration. It sure would be nice to have 15v topped up batteries! Are you able to get those panels up higher? I see it's cloudy but seems they're a bit low and would be shaded by the trees - hard to tell in the pic. From the direction of the photo, I'm looking Northeast. About where the sun is currently rising. It shades a bit of the morning sun, but very quickly the sun is up and beaming on these panels. Yes, I'd like to do a much better solar panel install, this is what was here when I moved in. There is a bit of a tilt to the South Southeast. I was quite worried about wiring up my batteries like this because right at the beggining of my soalr adventures I short circuited a battery and gave myself quite a freight. Nothing happend luckily apart from the battery terminal melting a bit. the easiest way to describe it would be to wire 4 x 6v batteries in series first i.e positive to negative. DO that for your 4 indiviual strings. then connect them in parallel, so all of the + to + and all of the - to -. here is a vid of how I did it. I have my battery bank wired in this way but someone pointed out that its quite a dangerous way to wire your bank because if there is a short circuit, there are endless pathways for the current to go through and destroy your whole bank. The recommendation I got,(and have followed) is to run all of the parallel connections with thinner wire as they dont see much amperage anyway. I checked this and that was correct. I never saw more than 10 amps going through the parallel connections. So what I did was run the parallel connections with much thinner wire with auto fuses(10amp fuse) on each line. like that if there is ever a short circuit the fuses will blow. You also need a midpoint fuse on each individual string. As in, in the middle of each string. If you have 4 6v batteries in series then the fuse would go between battery 2 and 3. I'm sure there are improvements to the concept that can be made as you've shown. As long as the thinner wire isn't restricting anything, and it sounds like it isn't then it shouldn't make a difference. Fuse idea seems good. And of course we never plan on shorting anything! Maybe someone can 3d print some kind of plastic cap that covers the connection snugly somehow. Am I correct in that there is no way to actually do this “hard-wire for equalization” and/or it is not necessary when we only have two 12 volt batteries wired in series for a 24 volt system? Thanks in advance for any response! The need for hardwire equaization is to have equal impedances between all the batteries,Yes if you have only two batteries 12v each and they are wired in series to get a 24v battery bank that is all that it needs.